Cadmium oxide codoped with Al and Gd ion powders was synthesised by thermal codecomposition of a mixture of complexes of cadmium acetate dihydrate, gadolinium acetate hydrate, and aluminum nitrate nonahydrate. The mass ratio of Al/Cd was fixed while the mass ratio of Gd/Cd varied systematically. The purpose of the present study is to synthesise and study the transparent conducting oxide (TCO) CdO powder having room-temperature ferromagnetic (RT-FM) properties. To realize that purpose, the synthesised Al/Gd-codoped CdO powder was annealed under hydrogen gas with certain conditions. The X-ray diffraction (XRD) method confirmed the formation of a single nanocrystalline structure; thus, both Al/Gd ions were incorporated into CdO lattice forming solid solutions. 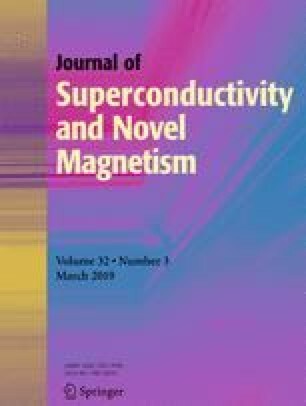 Magnetic measurements revealed that some of the doped CdO powders gained paramagnetic (PM) properties where the susceptibility increases with increasing dopant Gd content; the measured effective magnetic moment of dopant Gd3+ was around 8 μB. Furthermore, the magnetic energy of the created RT-FM of the codoped CdO samples by hydrogenation was found to be dependent on the Gd% doping level. For hydrogenated CdO powder doped with 3% Gd, the coercivity (Hc) was 195.9 Oe, the remanence (Mr) was 0.77 memu/g, the saturation magnetisation (Ms) was 5.05 memu/g, and the energy product (Um) was 150.6 merg/g. Thus, the possibility of production of TCO CdO with RT-FM, where magnetic characteristics can be tailored by doping and post treatment under H2 gas, was proven. Thus, a new potential candidate to be used as a dilute magnetic semiconductor (DMS) was successfully synthesised.